Jacks was a nightclub hiding in the brickwork tunnels near London Bridge. It was later renamed to Crucifix Lane, but closed down in 2015. A nightclub hiding in the brickwork tunnels near London Bridge. 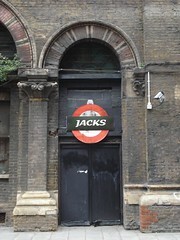 It used to be somewhat tricky to find, but there is now a big tube-roundel-style sign saying "JACKS" outside. It has two rooms: annoyingly, you have to go through both of them to get to the cloakrooms, which are in a far corner of the main room. The main room has a stage at the front, and raised platforms at the sides which you can dance on if nobody's sitting there. Various psytrance events are held here, and are usually tremendous amounts of fun, attracting a very friendly crowd, and running from around 10pm Saturday until some time on Sunday -- it's always been going strong when I've bailed as late as 9am. Security are extremely friendly. Unfortunately the loos can get pretty nasty: the gents' looked like it was undergoing repairs (bare brickwork, visible rafters, etc) some time in 2006, but seems to have deteriorated further as of late 2008. They have the usual pseudo-smoking-area on the pavement outside the door constructed from temporary metal barriers. Last visited by doop, November 2008. Last edited 2019-04-16 10:35:36 (version 14; diff). List all versions. Page last edited 2019-04-16 10:35:36 (version 14).